What- or who- is The Owl With Tongues? The temporary office Elion Okar has set up in the break-room of the Seaflower Institute is a mess, although its creator insists to me it’s a complex system. He is searching for links in the puzzle of the ‘Owl With Two Tongues’- a mystery that has dogged him since he was an undergrad. A mysterious amulet found alongside evidence of an ancient sacrificial ritual, dedicated to a being otherwise unheard of, lost to time. Elion has three favourite possibilities amongst the sea of papers decorating my breakroom floor. This woodcut illustration is from the bottom of a page of a 14C manuscript documenting the daily work of a popular bishop. The accompanying entry recounts the story of a man: ‘for whom his good wife sought help, for he had torn apart his son’s dog, and it he then devoured there upon the ground’. His wife, understandably concerned, went immediately to the house of the bishop; who accompanied her (along with several strong men recruited from nearby fields). “we looked upon an owlfaced mad-man, naked and scrabbling in the fresh turned sod for worms, which he consumed with vigor’. Found in a sealed off cave system, the Lightning King has always been overshadowed by the other paintings in the Blue Worm Cavern. The bold blue dragons distracted from the cracked stick man and his faded throne of skulls. Its debated what of this mysterious figure is the original etching and what is cracks in the dry rock face- but there is an undeniable resemblance to the symbol involved in the recent Revery necromancer activity. This connection has the least evidence to connect it, but it’s my favourite because i have a fondness for cryptids. The Owlman is a folkloric creature sighted in Cornwall in 1976, around a church built on prehistoric earthworks. 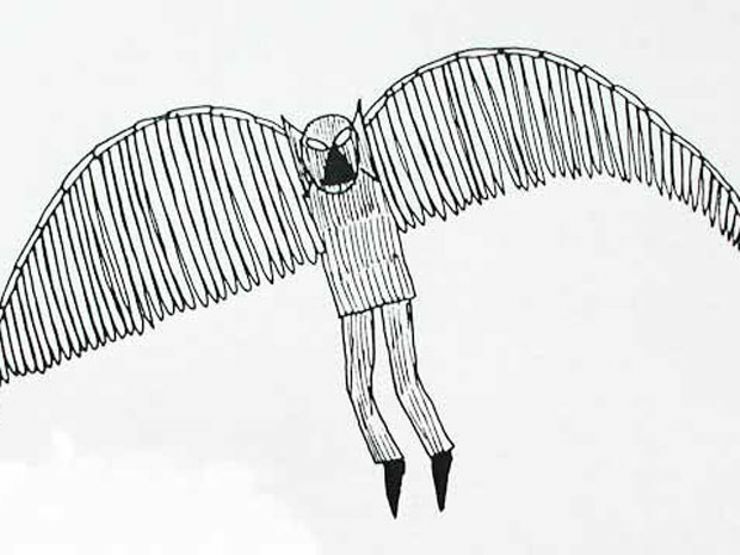 Reportedly (from several different accounts) the owlman is a feathered birdman with huge eyes, pointed ears, and pincer hands (see Morgawr: The Monster of Falmouth Bay by Anthony Mawnan-Peller). Will we ever find out about this ancient being? Part of me hopes not; but I fear that the Owl With Tongues is not done with this world yet. Jesper’s moth subjects continue to grow. Ugh.